We’ve been discussing tips for teaching your horse three in-hand maneuvers that are extremely important for the horse’s future from beginning work under saddle to advanced training. They are the forehand turn, turn on the haunches, and yielding. A “non-horsy” husband of one of my students was perplexed with the notion of teaching horses to “go sideways” as in yielding. Yielding is much more than just going sideways. It teaches the horse to respond to our aids, whether from the ground when we are first teaching this maneuver or to our leg when we ask him to execute it under saddle. Think of yielding as an exercise that encourages the horse’s hind legs (his engine) to be active underneath his body. The more active and “engaged” his hind legs are, the easier it will be for him to balance himself and do what you are asking him. Yielding is a very good exercise for loosening the front shoulders as the horse “swings” his front legs. It also teaches us how to coordinate our aids to ask the horse for lateral movement. As with all of in-hand lessons, outfit your horse with a properly fitting halter, with a longe line attached, and leg protection. 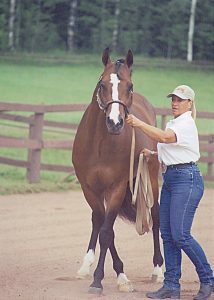 For this lesson attach the longe line on the halter’s side ring on the side you are leading. Like other in-hand lessons, I recommend introducing it in a smaller secure area like an enclosed paddock or round pen. I’ll describe this lesson as if teaching it in a small paddock. Once your horse is solid in this lesson, you will be able to execute it anywhere. When starting this lesson, practice it in the same spot each time. By doing this, the horse will be familiar with what you will be asking him to do. Once he is consistent, add additional spots until he can perform it anywhere within the training location you are using. We defined yielding as a maneuver where the horse stays straight and the forehand and hindquarters work together so he can move laterally. This maneuver builds on the lesson learned in the forehand turn, that is, moving away from pressure. Use the simple pattern I’ve shared to properly position the horse for yielding, but this time to the right. To do this, find a section of straight fence line that ends in a right hand corner or bend. 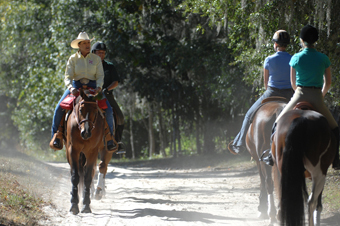 Stand so that you are leading your horse from his right side with him positioned between you and a fence. You will be “tracking” or moving to the horse’s right. Extend your left hand to lightly grasp the halter’s side ring, at the horse’s jaw, with just enough contact to guide the head. Do not hang on the halter or steer his head from underneath it! Remember the key to this lesson from last week’s newsletter– use this hand to encourage him to move FORWARD and very slightly flex his head toward you (away from the direction he will be traveling). Remember, the bend to his head is very slight, his neck should remain in line with the rest of his body. Later, as he becomes more schooled in this maneuver, he will be able to do it with little or no bend. When yielding, the head, neck, shoulders, and back should stay in line with the hips. Extend your right hand to apply the aid or “cue” for this maneuver to move the hindquarters laterally. The “target area” for this cue is the lower half of the horse’s barrel within a zone approximately 10 inches behind his heartgirth. This is same place where your lower leg contacts the horse’s lower barrel when your foot is in the stirrup and where you will cue for leg yielding under saddle. Be consistent where you apply this cue! The cue is not given up high on the flank, up on his sides, or back on his hip. Look at your horse and find the target area before staring this lesson. If your horse is sensitive to this touch, you may need to gently stroke him from his withers down to his shoulder to get him accustomed to the contact. Apply the cue using a cupped hand with a pulsating pressure, rather than poking the horse with your knuckles or fingers. Start the maneuver by extending your left hand and give a “cluck” to ask the horse to walk FORWARD and STRAIGHT—before any lateral movement is requested. When he is moving forward and straight, very slightly bend his head toward you as you apply the cue with your right hand in the target zone. Use your peripheral vision to see if his left front and hind legs are crossing over the right front and hind legs while he stays straight in his topline. If he does not stay straight, bring him forward and straighten him using the right hand on his halter, before asking again. When the horse moves laterally, lighten the pressure and follow his movement as he moves diagonally toward the fence. If he does not respond vibrate the pressure with the left hand, to keep him moving forward with a slight bend, and with the right hand to ask him to move his hindquarters laterally. When he reaches the fence, finish the maneuver by asking him for a few steps forward and straight alongside the fence. Ask him to whoa and praise him. Teaching this maneuver is as much about learning how to coordinate your actions as a handler as teaching your horse to move laterally to your commands. Avoid the common problem of standing too far away from the horse and not moving with him. 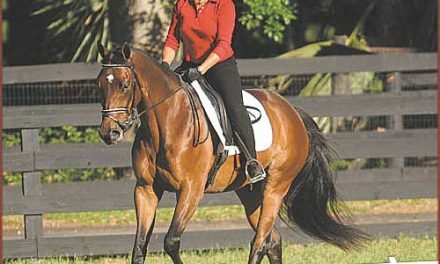 In this position the handler will lag behind her horse and pull him out of the straight-line body position. Be precise where the cue is applied. If it is given too far behind the target area or too high on the flank, the horse will have the tendency to swing his hindquarters out or resist, rather than move laterally. Don’t look down at the horse’s feet, but use your peripheral vision to monitor the horse’s topline to see if he is staying straight at the same time you note if he is crossing his front and hind legs properly. As you and your horse advance with yielding, you will be able to keep the head, neck, shoulders, back, and hips in alignment. The goal in teaching yielding is to get the horse moving more FORWARD and laterally, then just going sideways. This will help keep the neck more in line with his body. 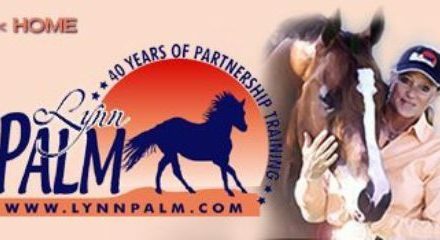 Once you and your horse are consistent with the in-hand maneuvers we’ve covered over the past several newsletters, combine them to keep him fresh and responsive. Here is a sequence of in-hand “patterns” that I demonstrate with clear visuals and more training tips at the conclusion of my instructional video Longevity Training Tape #3-Working In Hand. Try each sequence. When your horse is responding consistently, link them together, try them leading from each side, change directions, and add your own variations to create more challenging, fun exercises. Turn on the forehand 180 degrees- lead at the walk -increase speed to lead at the trot- whoa- back. Turn on the forehand 180 degrees- whoa- lead at the walk- increase speed to lead at the trot- whoa. Turn on the haunches right 180 degrees- directly to leading at the trot in a straight line- trot in a medium sized circle- whoa. Turn on the haunches 90 degrees- whoa- lead at the trot through a ½-circle- whoa- trot on again- whoa. 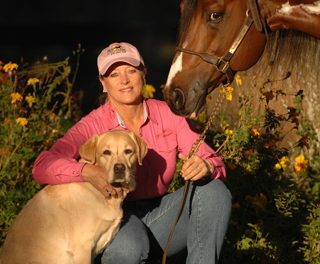 Either on the ground or under saddle, learning how to advance your training using my non-stressful techniques will help you develop a long lasting partnership and an obedient well-trained horse! Take the next step by visiting my website at www.lynnpalm.com.